Subject: - Revision of pension in r/o of Pre-2006 JCOs/ORs Pensioners/family pensioners. The undersigned is directed to refer to this Ministry's letter No. 17(4)/2008(1)/D (Pen/Pol) dated 11.11.2008 as amended, issued for implementation of government decision on the recommendations of the Sixth CPC for revision of pension/family pension in respect of Pre-2006 Armed Forces pensioners/family pensioners. 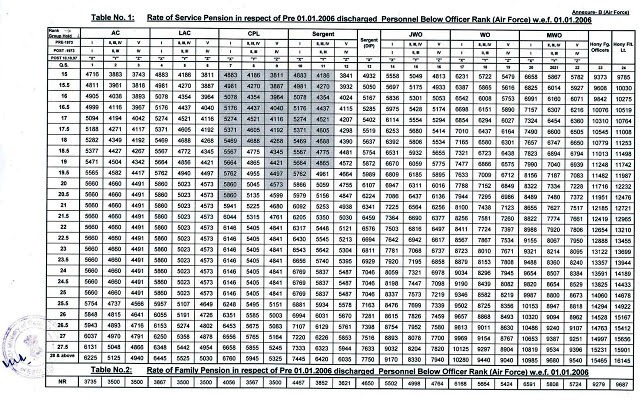 As per previsions contained in Para 5 therein, with effect from 01.01.2006, revised pension and revised ordinary family pension of all Pre-2006 Armed Forces pensioners/family pensioners determined in terms of fitment formula laid down in Para 4.1 above said letter dated 11.11.2008, shall in no case be lower than fifty percent and thirty percent respectively, of the minimum of the Pay in Pay Band plus the Grade Pay corresponding to the pre-revised scale from which the pensioner had retired/ discharged/invalided out/died including Military Service Pay and "X" group pay where applicable. 2. Now, after issue of GOI, Ministry of Personnel, PG & Pensioners, Department of Pension & Pensioners' Welfare OM No. 38/37/08-P & PW (A) dated 30.07.2015, it has been decided that with effect from 01.01.2006 pension/family pension of Pre-2006 JCOs/ORs Pensioners/family pensioners shall be determined as fifty and thirty percent respectively of the minimum of the fitment table for the Rank in the revised Pay Band as indicated under fitment tables annexed with 1/S/2008 as amended and equivalent instructions for Navy and Air Force, plus Grade Pay corresponding to the pre-revised scale from which the pensioner had retired/discharged/invalided out/died including Military Service Pay and X group pay. 3. 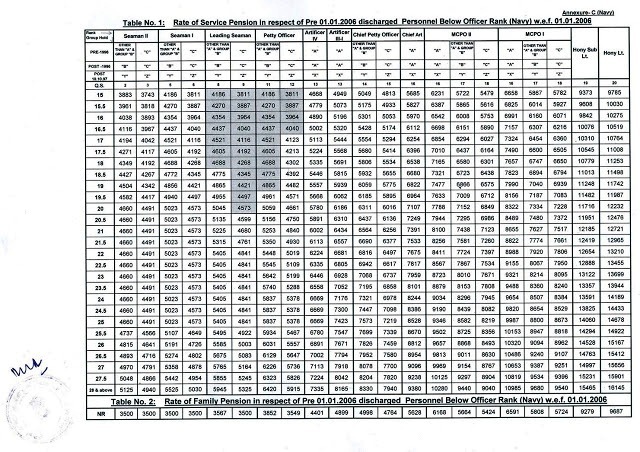 However, in case, the consolidated pension/family pension calculated as per Para 4.1 of this Ministry's letter No. 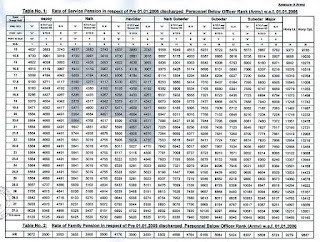 17(4)/2008(1)/D(Pen/Pol) dated 11.11.2008 is higher than the pension/family pension calculated in the manner indicated above, the same (higher consolidated pension/family pension) will continue to be treated as basic pension/ family pension. 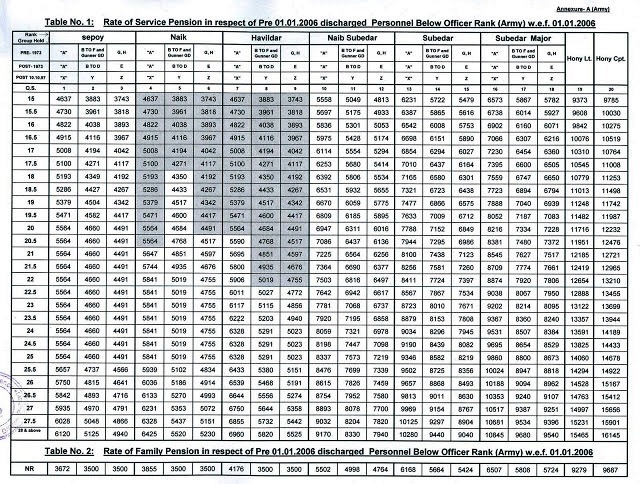 However, where revised pension in terms of GO], MOD letter No.PC-10(1)/2009-D(Pen/Pol) dated 08.03.2010 and No. 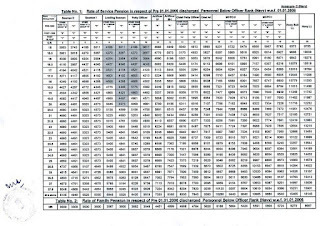 1(13)/2012/D(Pen/Policy) dated 17.01.2013 is higher than the rate indicated in annexure attached with this letter then the same will continue to be treated as basic pension/family pension from 1.07.2009 and 24.09.2012 respectively. 4. 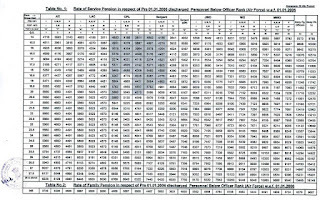 Accordingly, revised tables indicating minimum guaranteed pension/ Ordinary Family Pension has been annexed as annexure-A ( Army pensioners), Annexure -B (Air Force pensioners), and Annexure-C (Navy pensioners) to this letter. Pension Disbursing Authorities are hereby authorized to step up the pension/family pension of the affected pre-2006 pensioners where the existing pension being paid to the pensioners in terms of this Ministry's above letter dated 11.11.2008 as amended, is less than the rate of pension indicated in above said annexure. Necessary implementation instructions to all concerned shall be issued by Principal CDA (Pensions), Allahabad on receipt of these orders.